“Apple pie!” This is Alan’s answer every time I ask him, “what should I make for dessert?” It might be that I don’t make desserts very often and he just gets excited and shouts out the first thing that comes to his mind. He constantly badgers my mother to make him an apple pie, clearly not understanding the work that goes into it. My mother’s pie is the best, but you don’t just whip up a pie. There’s a process. It’s work. No store-bought crust in her recipe! It’s all homemade. In fact, my mother’s is so good, I’ve strategically never bothered to learn how to make one. I’m willing to wait for holidays and special occasions to indulge in a couple of slices. Alan however, is not so satisfied to wait. 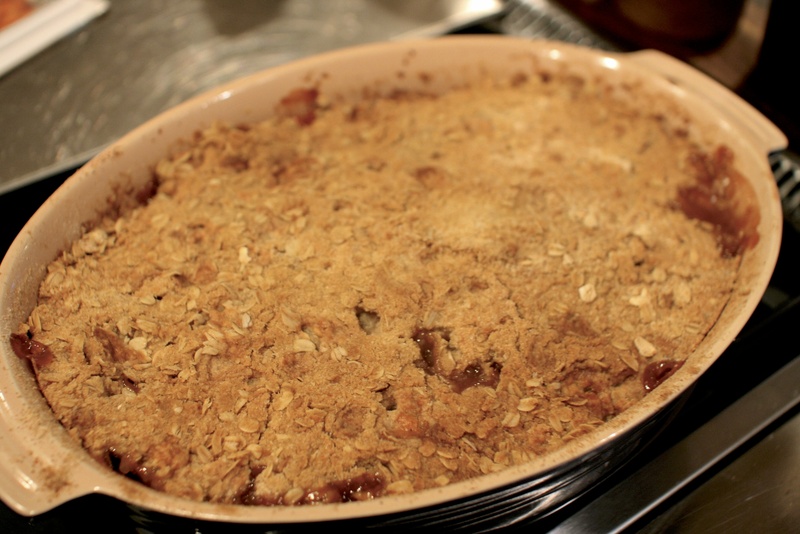 This apple crisp is a speedier solution to get my mother off the hook, and can be made any time. 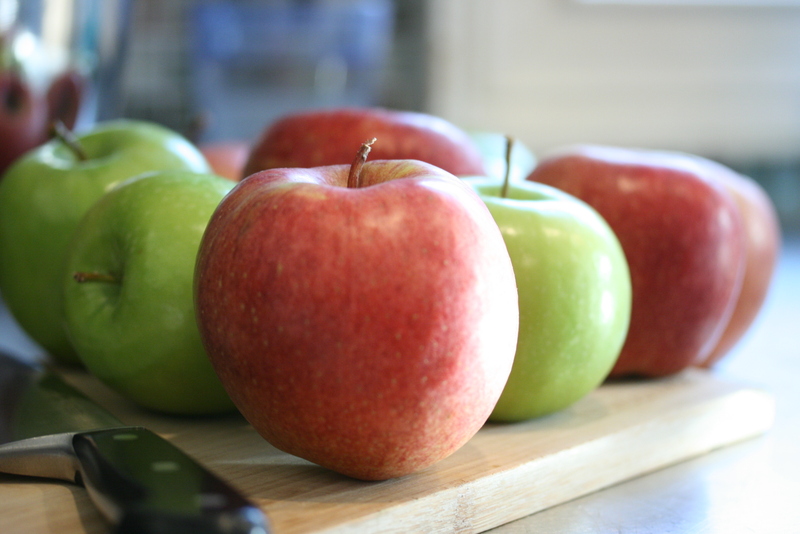 We have the best local farms with delicious apples during the Fall and Winter. I think Manoff Farms in Solebury, PA has the best assortment. Who knew there were so many to choose from? 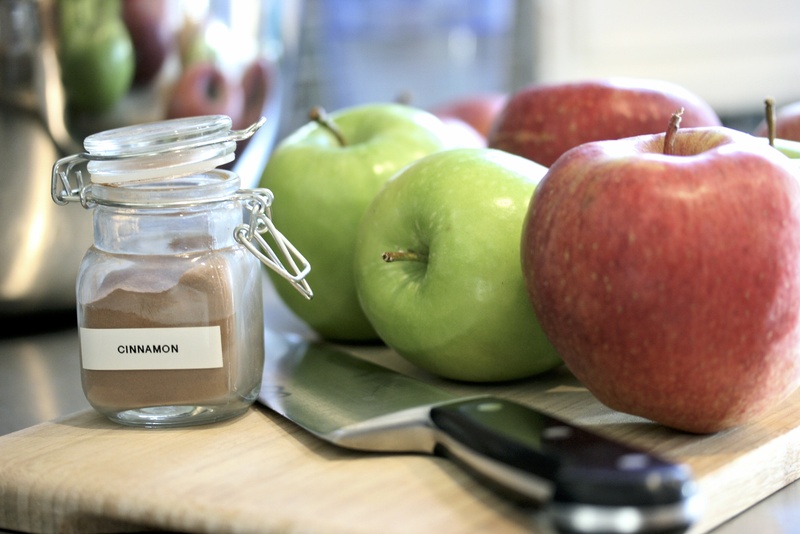 I’ve tried baking with a several kinds and have found that any combination of Jonagold, Rome and Fuji apples are perfect for baking. Of course, Granny Smiths work great as well. Serve this warm with your favorite ice cream. There are so many ice cream flavors beyond vanilla that are delicious with apple crisp. Dulce de leche, maple walnut, butter pecan and cinnamon would all be delicious. If only I had leftovers to eat now, sigh. I should mention that this recipe was adapted from a number of sources. Many called for more butter, can you imagine? The Barefoot Contessa uses multiple citrus juices. I think the lemon is only necessary to keep your apples from turning brown once sliced. I’ve never looked at it as an additional layer of flavor. Some don’t use oatmeal in the topping (heaven forbid! )… while others use raisins or more spices, like nutmeg or allspice. I like it simple, so this is what I came up with. Butter a large casserole and set aside. I use a Le Creuset Oval ceramic dish that is about 9″ x 14″ x 2.” Glass Pyrex would work fine as well. 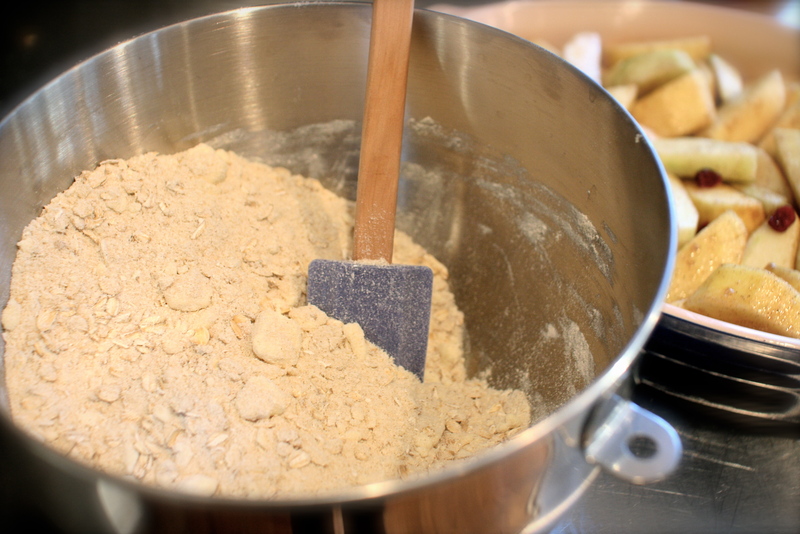 To make the topping, combine all the ingredients in the bowl of a stand mixer using the paddle attachment. Or you can use a pastry blender and combine it by hand. Either way is fine, just make sure your butter is ice-cold. You want it to look a bit dry and crumbly. The butter should be in smaller pea-sized pieces. Set it aside. 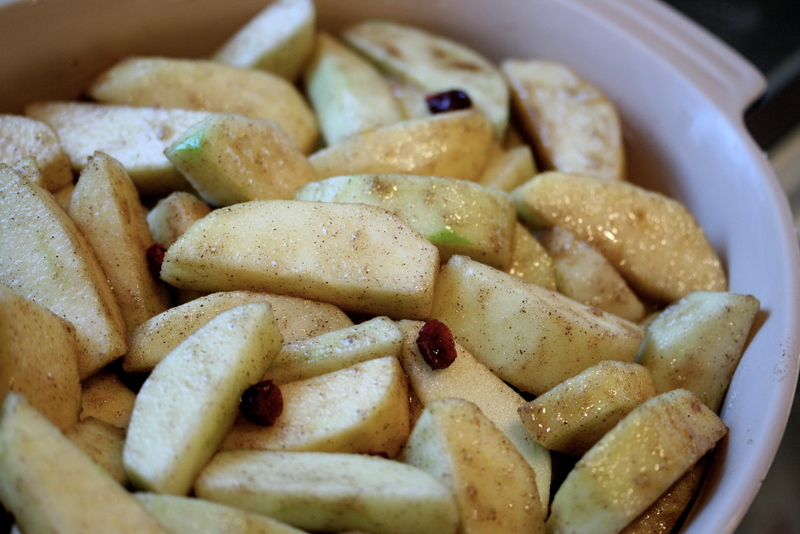 To make the filling… prep your apples and put them in a large bowl. 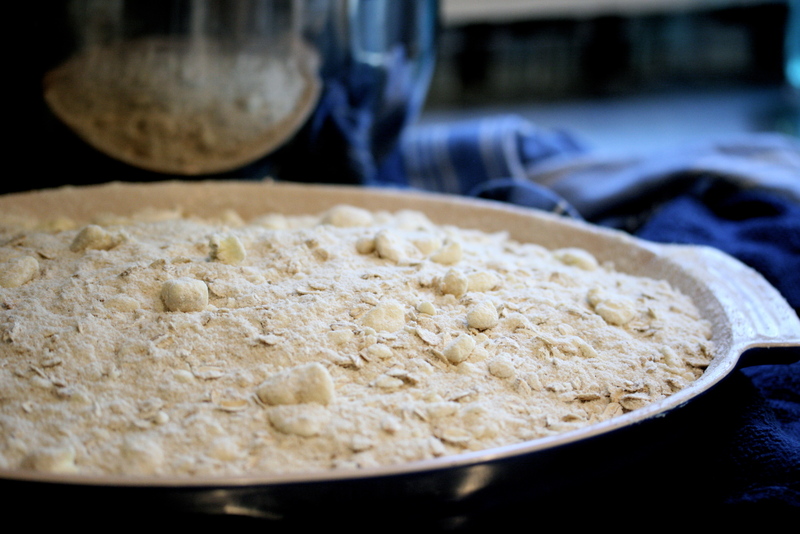 Fold in the remaining filling ingredients with the apples and pour into your prepared pan. Sprinkle the topping evenly over the apples. Bake in your preheated oven for about 1 hour and 15 minutes or until it’s browned and golden on top and the apples look bubbly. Serve warm with ice cream of choice and enjoy! No picture of a bowl à la mode? We ate it all before I could take the picture. Uh oh. * I should mention I love the random tartness of the few cranberries in this. You could omit them altogether (I know it’s a small quantity) or even add as much as a 1/4 cup.